Tokai Forum - a subsidiary of TokaiRegistry.com :: View topic - When was this hardpuncher borned? When was this hardpuncher borned? Posted: Wed Oct 15, 2008 11:44 am Post subject: When was this hardpuncher borned? I'm a new tokai enthuiast, and I'm in very need of help with this one. Why can't I ever find Tokais for $30, ?30, Eu30......? But what is it actually worth(aproximitly)? I`m not gonna sell it, no way, but it`s nice to know. These are difficult times but I'd say at least ?300-?400 on ebay as it's one of the high end models. A Music Shoppe in Sweden would probably try to get SEK6000, they normally charge around 5000 for a PB40 (and as the sticker indicates yours is a PB70). It recently cost me ?300, & it's a 45, so your 70 should be worth more. It should be better quality too. An original Tokai case? I think they are quite rare, so that would add at least ?50 to it's value. That's why I'm jealous. Where did you get it, if you don't mind me asking? $30 sounds like an amazing price, even if it were the lowest MIJ model (which yours doesn't appear to be) and if it weren't one of the late 70s/80s ones (which yours appears to be, judging by the headstock). sounds like a total score to me. 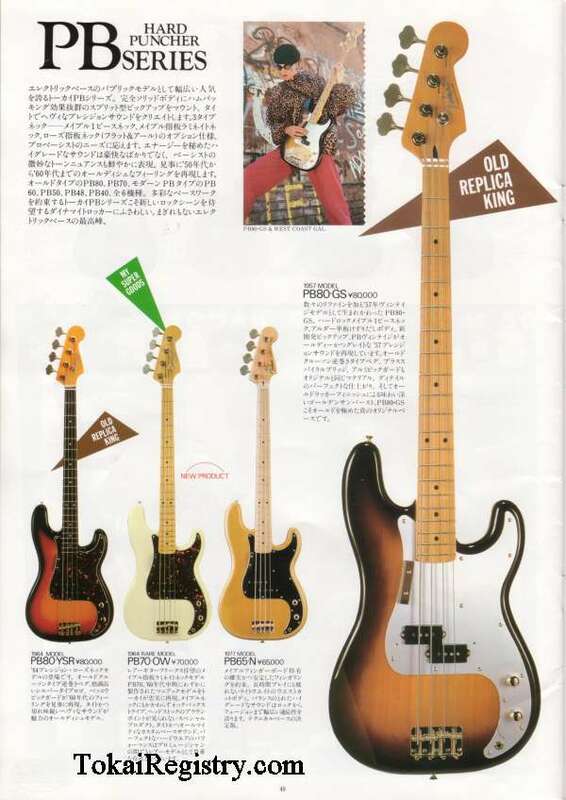 That's a high-end Tokai, (circa 1982?) and probably worth a bit more with the "spaghetti-type" logo. It's good it's still got it's sticker--don't ever remove it! It's got better tuners and bridge than the standard models, and that looks like a nice 2 piece body. Hard to know exactly what it's worth until you sell it--exchange rates and prices are all over the place these days with the world economy in shambles... I think I saw a PB-60 sell on ebay for about $550US this summer (before the market crash), with $120 shipping from Japan--still less than one might expect. I got this of a guy I used to know, and I had to get a bass for the marching band I instruct (drumming instructor). They had a Fender Musicmaster 78, but they gave it to me a year ago, but now they needed a bass again. I didn't wanna give my fender back, so I ask my old friend if I could buy his old bass wich he didn't use.. I didn't think it was a good bass..